Portable, automatic straight-line cutting machine, available in models to suit 110v input power supply. Simple design with a easy-to-use interface, these machines cut straight lines, circles (20cm-2m radius) and bevels on 5mm-50mm thick steel (Requires Circle Guide Kit). Constant adjustable travel speed - in forward or reverse - to provide good machine-quality cuts. 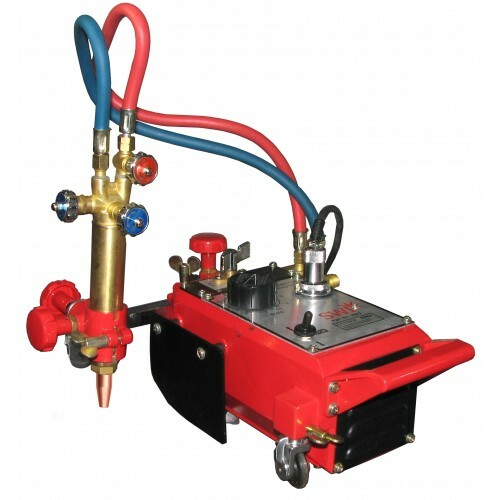 Robust and compact manufacture with brass and stainless steel machined components. Supplied with a 1.8m length of distortion-proof steel track (Extra lengths available).